What does it take to go to vet school? To even begin to think about going to veterinary school, you must first get into a good undergraduate institution. Clemson University is one of the most popular for veterinary students in South Carolina because of its Animal and Veterinary Science program, as well as the outstanding biology and other prerequisite courses for veterinary school. After being admitted to an undergraduate institution that can provide the necessary courses to apply to vet school, a student must maintain the highest GPA possible. Acceptance to the University of Georgia's College of Veterinary Medicine is highly competitive, as are all schools in fact. 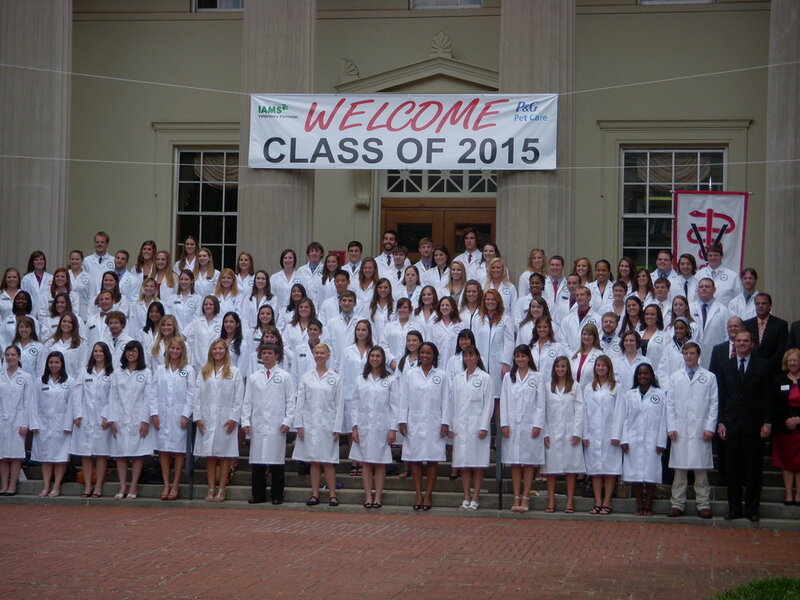 The class of 2018, at UGA's CVM, had an average GPA of 3.70, with South Carolina residents holding an even higher 3.75. Out of the 976 that applied for the graduating class of 2018, only 114 were accepted into the program. How long is veterinary school and what does that entail/cost? Veterinary school is 4 years of classes, rotations, and externships. Most veterinary schools have classes for the first 2 and 1/2 years, and then students move into clinical rotations. These rotations take students through 3-4 week blocks of orthopedic surgery, soft tissue surgery, radiology, oncology, neurology, cardiology, emergency/critical care and much much more. Students typically will also take rotations such as behavior, exotics, large animal surgery/internal medicine, farm practice, food animal practice, community practice clinic, practice management and more. During these rotations, students are typically required to take emergency shifts, and treatment shifts to further their education. Their externships consist of working with private practitioners, such as the doctors at Emerald City, or going to other institutions. Externships allow students to see a lot more cases that will be similar to what they will be seeing in private practice, rather than those seen in a specialty hospital. After their 4 years of veterinary school are complete, students must take a comprehensive, cumulative board exam just like medical students, and law students. This exam usually consists of questions that span all of veterinary medicine and takes over 6-7.5 hours to complete. Only after passing this exam, and applying for a license to practice in their respective state(s), can a student become a Doctor of Veterinary Medicine. Veterinary student's typically spend between $150,000 and $250,000 attaining their degree, not including undergraduate costs at institutions such as Clemson University. These costs include living expenses such as room/board, but tuition is also a substantial amount. In state tuition at UGA's CVM was $9,718 for one semester (vet school is 9 semesters). Out of state totaled up to a whopping $48,516 per year! Can a veterinarian specialize like a human medical doctor? Absolutely! Many veterinary students go on to a rotating or focused internship, which then translates into a residency in a specific field. They can specialize in surgery, internal medicine, ophthalmology, oncology, and so much more. The internship and residency add another 4 or more years onto a veterinarians eduction, on top of the already 8 they had spent acquiring their Doctor of Veterinary Medicine Degree. Many specialists, unlike private practitioners, however, go on to work in large teaching institutions like the University of Georgia's College of Veterinary Medicine, or large referral hospitals like Upstate Veterinary Specialists in Greenville. Do veterinarians have to complete Continuing Education? Yes! Just like lawyers, human medical doctors, and other specialized professions, veterinarians must complete at least 30 hours of continuing education every 2 years according to South Carolina law. Continuing Education can consist of a small amount of hours based online, but most must be hands on learning, or classes. Continuing education is one of the many tools veterinarians use to stay up to date on state of the art medicine and standards of care. Medicine advances quickly, and veterinarians, like our at Emerald City, must work hard outside of normal business hours to stay up to date with new techniques, medicines, and educating clients. What does a typical day at a veterinary practice consist of? Unlike many jobs, veterinary medicine does not typically allow for a set work day. Most veterinarians arrive at the clinic early to start their day, either checking on their hospitalized patients, reading over their schedule to be familiar with cases they have that day, or preparing for surgical procedures they have. On surgery days, the vet will examine the patient thoroughly, evaluate bloodwork that was drawn and ran by the technicians, and then prepare for the procedure. For hospitalized patients, the doctor will perform a thorough exam that morning, check any update on bloodwork, ask the technicians how its appetite/water intake has been, and if needed, call the owner to give an update on the case. If a doctor is seeing appointments during the morning, they will typically review the case before seeing the client, especially if it is a recheck. The client and patient have been checked in by the front desk staff, and technicians have already taken a thorough history and then brief the doctor on the case at hand. After the case has been seen, the doctor will formulate a plan, which might include estimates, scheduling surgical procedures, prescribing medicine, or referring the patient to another hospital such as Upstate Veterinary Specialists. After the case has been handled, the work is definitely not done. After any hospitalized patient is examined, a room is seen, or surgical procedure performed, the doctors and technicians must thoroughly document the case in the record. This includes the SOAP, which is an acronym for Subject, Objective, Assessment, and Plan. Each section includes things like history (subjective), exam findings (objective), the doctor's diagnosis/thoughts (assessment), and the plan (treatments, surgical procedures, referral, and diagnostics). The medical record at Emerald City is entirely computerized, which allows us to easily document, search, and properly back-up our clinical records. By the end of the day, doctors and technicians may have seen 30+ patients, and done several procedures. Interested in more about our staff? Look for a future article on our other staff, including our technicians and highly trained reception staff! These are no ordinary people! They work long hours, and have an intense passion to care for you and your pets. After all, we think of them as our family too! Smile! February Is Dental Month! $20 Off Dental Cleanings! Sign up to receive news, updates, food recall notices, and more. We respect your privacy. We will never share your email with any 3rd party. Thank you for signing up. Be on the lookout for some great content in the near future! Thank you for helping us to improve our site experience! We may respond to you based on your feedback if we have more questions.